Can you rely on contemporary media in an era where social and political unrest is neither about left or right, nor about right or wrong? Can this media be the sole representative of nuanced local & global issues? As fellow graphic designers we understand the need for valid and engaging representation of social, political, and cultural issues, which is seldom visualised within mainstream media. In a time where opinions need to be heard and attention spans are decreasing, there is a need to visually represent such dire issues. 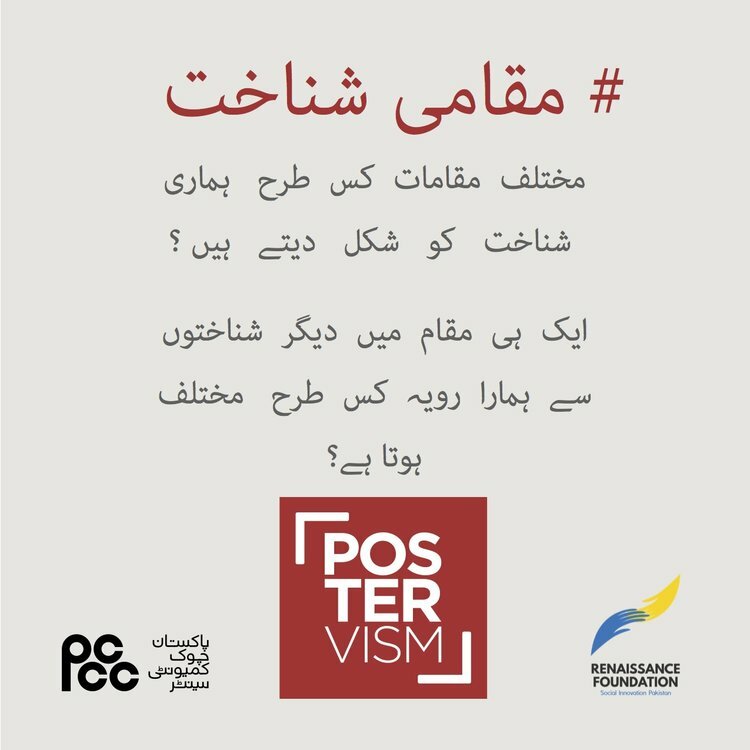 Pakistan Chowk Community Centre in collaboration with the Renaissance Foundation of Social Innovation Pakistan has launched a national poster design competition called "Postervism". 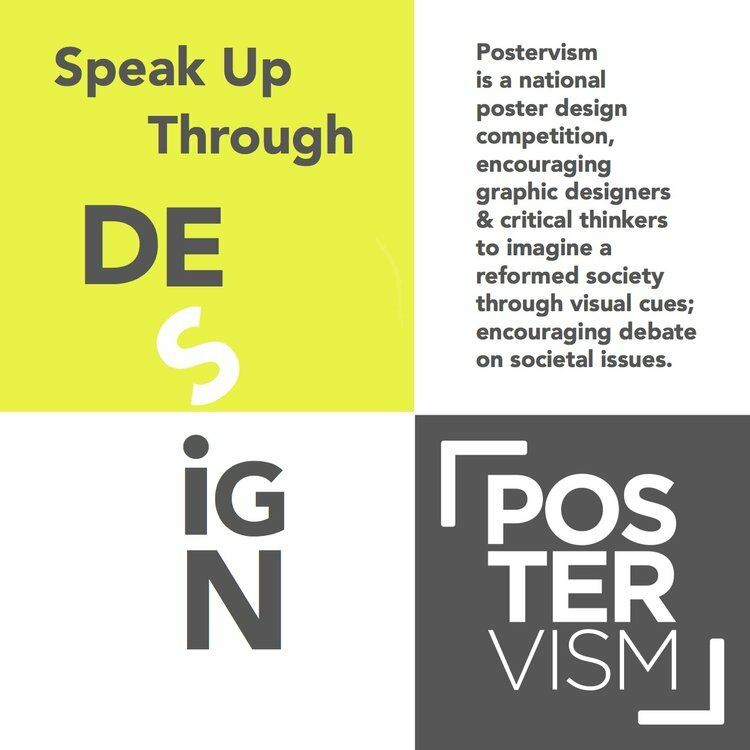 Postervism, as a poster designing competition, gives you the chance to do exactly that. Graphic Matters shows critical imagination by activists, who honour freedom of expression and challenge their audience to shape their opinion. The competition hopes to encourage young designers, critical thinkers, and aspiring academic scholars to highlight social, cultural, and political issues within our society through the medium of design. It aims to develop a collection of graphic stories and visual activities in a form of a research board that makes us see the world differently. Young talented designers and established artists from Pakistan can use their skills to shed their light on current stories and offer their audience a new perspective on social issues that are rarely vocalised throughout the news media. Although written analysis and scholarly articles have an enormous role in getting people to think about the issues; there is a different kind of engagement that comes about when the stimulus is visual, and there is minimum reading required. Visual cues will also enable the designers to imagine a reformed society, where they will be able to visually portray their ideas of a reformed society. 1. Gender Impartiality-- The participants will be required to visualise a gender egalitarian society. Imagine a society where gender is treated impartially. Where you do not have to think twice about entering a space based on the gender you identify with. Where you get a promotion regardless of your gender. Where you gender does not impinge on your right to: healthcare, education, employment, space and existence. 2. Spatial Identities-- This theme will explore how the space one inhabits shapes ones’ identity accordingly. How do the spaces we navigate inform our sense of identity; how in turn, do our identities influence how and what spaces we choose to navigate? How do minorities navigate spaces differently than those who associate themselves with the majority? How does privilege inform the spaces we choose; how do spaces inform our privilege? 3. 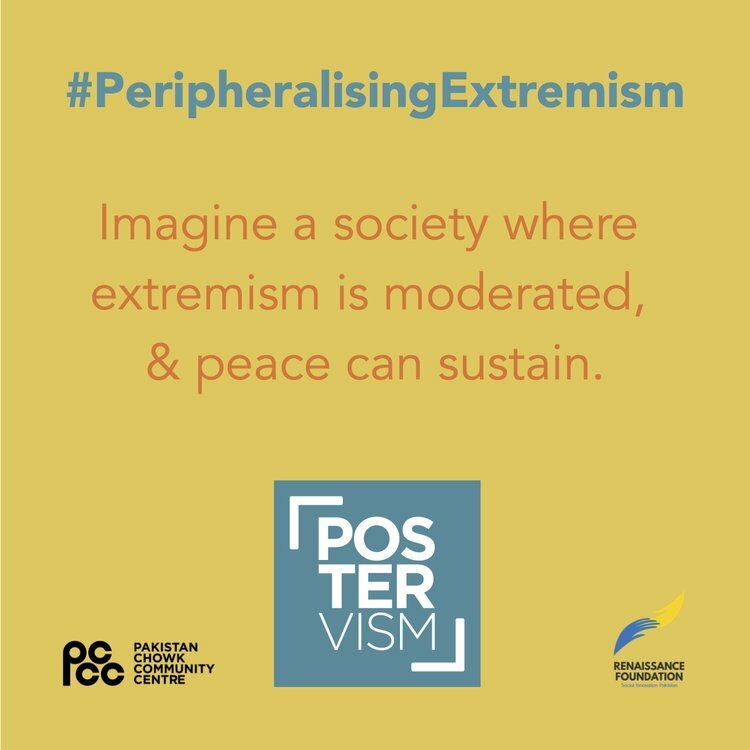 Peripheralising Extremism-- This will encourage the participants to visualise a society that does not breed extremism. Imagine a society that doesn’t breed extremism. Where multiple identities can co exist without the need of one being superior to the other. Where there are no strict notions of right and wrong, left and right. Where violence is rare, and is dealt with caution and justice. Where food and shelter is cheap, and human and animal lives are expensive. After the Open Call was announced in November 2017, through various social media platforms such as: Facebook, Instagram and Twitter, after which design meets that were based on the three topics were arranged. A series of workshops were conducted in February as a pre requisite to the poster designing process, called “Activism meets Design” which took place on 4th February 2018 at IBA Main Campus; The natures of the discussions held were to enlighten the three shortlisted topics in order to provoke and engage the audience, rather than being passive entities of spectacle. Many speakers were invited from different disciplines to shed some light on the varying themes. The panel included Dr. Naveen Minai, Nida Kirmani, Sara Shroff, Zohaib Zuby, Durri Alvi, Dr. Severine Minot, M. Ayub Ayubi, Jibran Nasir and Omar Shaukat. The dialogues in the workshop led to some vital questions being raised that aimed to help de-stigmatise stereotypical mentality. This highlighted the issues, which are either not acknowledged by the society, or are given little to no importance within the bigger social policies. With the poster submission deadline being on 28th February 2018 led to a total of 50 submissions out of which 25 were shortlisted by the jurors. The selected posters will be travelling from Karachi to Islamabad at Press Clubs and Community Centres in July. Activism Meets Design Conference | Peripheralising Extremism | The audience engaged actively in the third and final topic of the evening. With the design conferences coming to an end, the question of where to exhibit the posters arose, keeping ‘thinking spaces’ in mind. The space is the starting point for every exhibition design. How architecture is used to circulate in the space is always of great symbolic significance. Will the architecture showcase ­itself or will it be overlaid with a new spatial intervention? The trio of object, presentation and space defines the overall impression of an exhibition, generates the first impression and determines the narrative. However, our aim is to put up the work in a space where there is no intervention. Showcasing work in everyday spaces that are not interrupted would engage the audience more, making the work itself become a part of everyday life, making it evermore so impactful. The prime options, therefore, would include community centers and press clubs. A community center is defined as a place where people from a particular neighborhood can meet for social events, education classes, or recreational activities. In this way, using such spaces to exhibit the pieces would make local talent the main focus thus facilitating the production and dissemination of innovative ideas making art more accessible to the public. Therefore, men and women of the community are joined together in mutual educational interests, which stimulate their thinking pleasure in learning. There is a strong emphasis on locality. As a result, the exhibit is widely available to masses. A press club is an organization for journalists and others professionally engaged in the production and dissemination of news. By using this space to exhibit the work, the exhibition would receive more publicity on various forms of media such as the newspaper, television, radio and Internet. Hence, increasing the exchange between the community and the work being exhibited. With the entire project being referred to as a ‘touring exhibition’ ensures the sustainability of access to high quality temporary exhibitions to all. With the work travelling around Pakistan it opens itself to a far more vast audience than it would if it was held in one particular location. Touring, therefore, is a great public outreach opportunity where we can highlight the importance of this work and its message on a much larger scale.